The other day Harry decided that he was going to turn his room into a library. He made some little library cards and stuck some labels on his shelves, it was very sweet. So while he was at school I stepped it up a notch and got out the printer and the laminator to surprise him. I turned as always to Twinkl, and found plenty of resources to get me started. I began with a Welcome to the Library sign for his bedroom door, part of a pack of Library Display Signs (Twinkl subscriber resource). I'm so glad that we now have a working colour printer as previously I was always printing in black and white (I'm afraid that it's going to cost us a fortune in printer cartridges though as I do have a tendency to get carried away!). I also printed out a poster for the wall which says Please be Quiet in the Library from a pack of Library Display Posters (Twinkl subscriber resource). I also couldn't resist this gorgeous poster with the words "Reading gives us somewhere to go when we have to stay where we are" (Twinkl subscriber resource). Even though I'm pretty good at weeding through his books and passing on the ones that are no longer suitable or review books that didn't really grab us, Harry still seems to have a lot of books. But each child has a large Ikea Billy bookcase in their room so they have plenty of book storage. Mia has a couple of shelves of books in her room too of course, but the majority are in Harry's room simply because he has quite a collection of books that both children have yet to grow into, and as he's the oldest it seemed the logical place to store them. I'm awful for picking up copies of books that I enjoyed when I was little, and many of the books are my old books, as well as lots that are my Dad's old books! Harry's books were vaguely sorted into categories, but to help with the organisation I used the free Editable Book Shelf Labels (free download) so that I could come up with my own categories. I kept it simple for now, I might return to make more if he starts to collect more books on particular topics. 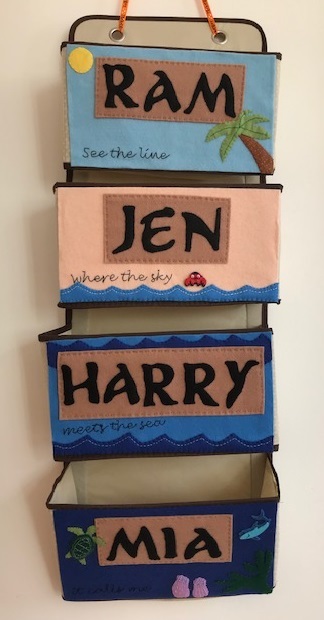 One of the shelves is labelled By Harry, where I'll put the holiday scrapbooks that he loves making, and his own notebooks of stories. Twinkl also have some lovely Library Role Play Book Labels (Twinkl subscriber resource) with some simple categories and pictures. 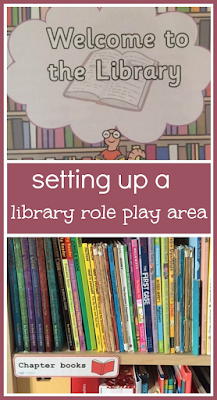 So that we could actually play libraries I made each child a Librarian Role Play Badge (Twinkl subscriber resource) and made us each a Role Play Library Card (Twinkl subscriber resource). Harry is very proud of the library card that he has for the school library so I tried to make it look similar and decorated it with a sticker. Harry really loves his new library! He's desperate for us all to borrow his books, and he very carefully ensures that we are each selecting books at the appropriate reading level. 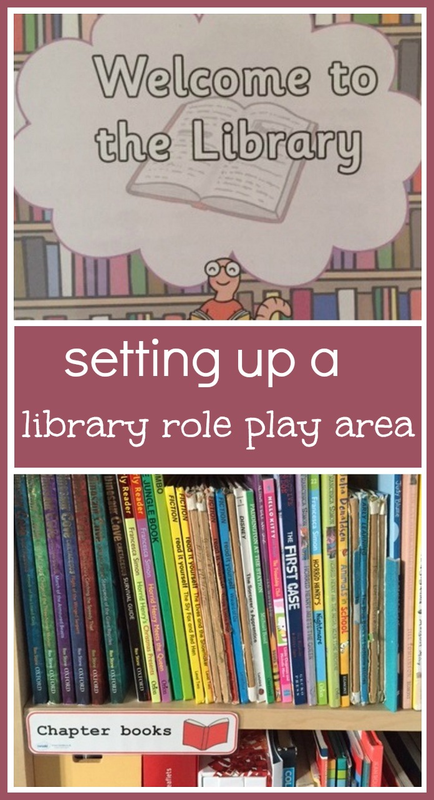 It's great for role play, and also for helping him to work his way through all his lovely books! I'm a Twinkl blogger and have been provided with a free Premium subscription. Twinkl are amazing though, and I'm always writing about them with no obligation, just because I want to share their fabulous resources. Yay! Library Play! We love doing that. There are still some old signing out cards on the insides of books from my older too. My littlest then panics that we need to return it to (the real) library. We stamp cards old school style. Have fun! I think we should get a stamp, they would love that! I used to work in a library and I remember swiping the bar code and stamping the books with the special pen, loved doing it! That is a great role play set up, I'm not surprised Harry is pleased with it. We have lots of children's book around the house as I want to encourage both of them to be interested in books, but they are not organused at all. The closest we've got to library role play is our local library allowing the children behind the counter and tap on the computer keyboard. Thank you! I do like organising books, so it suits me perfectly!